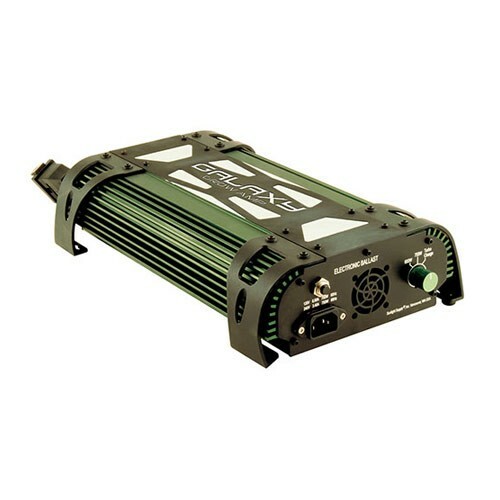 The Galaxyﾮ Grow Ampﾮ 750W ballast can operate a 750 watt lamp at 600 watts & Turbo Charge a 750 watt lamp. Galaxy Grow Amp ballasts come pre-wired with a Sun System lamp cord receptacle. They are compatible with all Sun System branded reflectors. Includes a 6 foot 120 volt power cord. Purchase a 240 volt power cord separately. Specifications: extremely efficient - 99.9%; 902215 - operates 400 watt HPS/MH & 600 HPS lamps, 600 HPS and 750 HPS/MH lamps, and 400, 600 HPS/MH lamps. Soft starting, extruded aluminum housing, fan cooled for superior thermal management, lightweight, very quiet and limited vibration, voltage: 120 or 240. Compatible with double ended lamps.